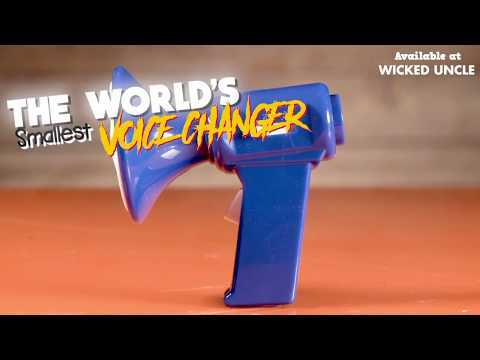 Find your ideal vocal register with this travel-sized, megaphone-shaped voice changer! Including in its equally tiny box, you'll find the voice changer itself with its instructions. It's the best prank to pull on teachers, parents, aunts, uncles, buddies, siblings, mailmen - anybody! They'll never see it coming. The battery's included in the set, so all you'll need to do is set the switch on the side to whichever kind of voice distortion you need for the moment, pull the trigger, and start tricking your neighbor into thinking you're an alien life form come to destroy the Earth. Endless fun can be had with this super unique, super wicked fun-sized toy! Size: 2" x 3" x 3"
Zoom through the air with range up to 30' and 4 direction navigation! Use the voice controlled smart watch to make your car move! Super spy, wrist-mounted walkie talkies - hidden mic and earpiece.